With various forms of portable music players available it may be a tough decision to choose between which combination of size, price, and features suits you best. One commonly overlooked but very cheap alternative is the MP3 CD player. Evergreen technologies has developed one of these such units, which is available from their site for a bargain $99.99. The MP3/CD player is capable of playing CDs filled with mp3�s of up to 192kbps bitrate, as well as normal audio CDs. The package includes the player, a set of earpieces, 2 (rechargeable) Nickel Cadmium batteries, an instruction manual, and a power pack to hook up to the player for recharging. (NiMH batteries will also work but they will need to be recharged in a standalone charger before being used in the player). The charger for the NiCad batteries is internal so all you need to do is plug in the power pack into a socket, or use a car lighter power adaptor. The player also allows charging while playing at the same time. Alkaline batteries will not work in the player, but you will get about 2 hours of playback with the NiCad batteries provided. The MP3/CD player is the same size as a portable CD player, and includes all the funky features you�d expect of it plus more. The key difference is the ability to play over 7 hours of music at 192kbps (12 hrs at 128kbps) on a single disk. Short of a few Mp3 players available which utilize an internal HD, this is the highest capacity available in any portable player. 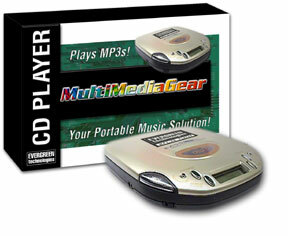 The Evergreen MP3/CD player is also being lighter, and 1/3 the price of such Mp3 players. Also included on the player is a line out feature, meaning that you can play your Audio/MP3 CDs through it onto a stereo system, or in your car � much more convenient having over 100 tracks on a single disk instead of 10-15 from a normal Audio CD. There is a plentiful 50 Sec anti skip buffer installed, making it suitable for use when jogging, etc. I think that 50 seconds could be relative, as one second of an mp3 is significantly smaller than one second of a CDA (wave) file. Short of continuously shaking the player to test, I have found no problems with either in normal use. Incidentally, Evergreen has included a feature to record into the memory by utilizing the anti-skip buffer. This will allow you to record presumably up to 50 seconds of audio by plugging in a microphone into the player. I suppose it could be a useful feature if you�d like to leave yourself a message or record anything interesting around, but since it uses the anti-skip buffer, as soon as you go back to playing an audio file the recorded message will be erased. Another feature on the player is the bass equalizer. This includes 5 different modes ranging from a strong bass boost through to a strong treble boost � great for reducing irritating basey beats or increasing weak low frequency playback on certain headphones. As with any equalizer though, changing the db level can sometimes distort the audio quality. Program mode � In the order that you have programmed the tracks to play. You can shuffle through the files on the CD either by file, or by directory. The main problem with the player system is that the LCD display only features a single row display. Browsing through files will be difficult as there is no graphical navigation tree system. The player cannot display the names of the files or directories, and instead uses a numbering system. All directories are listed as numbers from the root directory, then into the first subdirectory, and any following subdirectories, etc. Think of it as being a probability tree numbered in order through each branch from the top to bottom. This is somewhat complicated, made even worse so by the fact that the player will only show each mp3 by a number, determined in the same order as the directory listing, numbered from their alphabetical order in each directory. For this reason it is important to have a well defined system before burning any Mp3 CDs to make browsing through files on the player as simple as possible. For example, many subdirectories with further levels of subdirectories will make it difficult to browse through. The MP3/CD player has several limitations, including the 192kbps max bitrate. Personally I don�t find this a problem as I feel 192kbps is sufficient quality, especially for a portable player. Most people using portable equipment probably will not have good enough quality headphones to take advantage of a higher quality playback anyway. Any attempts by the device to play higher bitrate mp3s will result in a fuzzy, distorted playback for the duration of the track. There is a 650MB max size � 700MB CDs can be used but anything after the first 74Mins on the disc will not work. Only MP3�s will be recognized on discs with multiple data types. No Mp3 files following a non-mp3 file will be recognized � sorted by directory/alphabetical order. On CD Extra discs (CDA followed by CD Data), only the audio CD portion will be recognized. Overall it is a pretty good unit, with no quality problems in music playback. The 7+ hours of music per CD is a great capacity while still being lightweight and reasonably small. As an added bonus it comes with several advanced options such as programmed order music playback, sound equalizer, and a line out for use with external speaker systems. However there are a few irritating aspects, mainly the navigation system. A larger LCD display with the ability to display directory and file names would make it infinitely easier to use. The LCD display also does not feature a backlight, so it is necessary to have an external light source to see the screen. Another aspect would be to increase the playable bitrate up to 320kbps. Even if the quality difference is not very significant, it makes it a lot easier not having to re-encode any mp3s you have to a lower rate to make it playable on the system. The best part of the player is it's value for money, it is not much more expensive than a portable CD player, and still significantly cheaper than Mp3 or MD players. With more and more people having CD Burners and with cheap CDs available this is a very viable alternative solution at the moment.